Become second in line to lead an Empire this Halloween in our Darth Vader 1/2 Mask. The 1/2 face mask is injection molded with smoked plastic eye lenses for clear vision. There are openings around the mouth area for comfortable breathing. This mask is suitable for both adults and children. 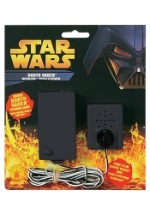 Add it to any of our Darth Vader costumes with Vader's lightsaber and browse our other Darth Vader costume accessories.